THIS IS THE GOOD STUFF! NESTLED IN THE HEART OF THE SHELBY TROPHY TRIANGLE! 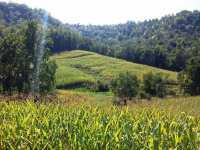 170 ACRE WITH TOP ACCESS AND WELL GROOMED TRAIL NETWORK. 31 ACRES OF TILLABLE IN THE VALLEY . . .
DRIFTLESS PARADISE FOUND!!! ENJOY PRISTINE VALLEY VIEWS BORDERED ON 3 SIDES BY THE COULEE EXPERIMENTAL FOREST. LOCATED JUST EAST OF BARRE MILLS AND ONLY 3.5 MILES FROM . . .
1 Listings in Bangor WI ..
1 Listings in Shelby WI ..